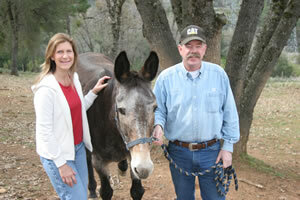 Doug and Lori Veerkamp have six mules. They, their family, and friends ride the mules throughout the Sierra Nevada Mountains during the summer months. "IF” was their third mule. 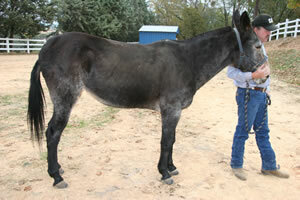 She was fourteen years old when they got her, and as they were soon to find out, she had chronic hoof problems. Her hooves were shelly and cracked, with very thin hoof walls, and the springtime would find her with multiple abscesses. Because of this, it was difficult to keep shoes on. Many of the standard remedies were tried with no avail over the next thirteen plus years, and their Farrier, Gregg Anderson, did his best. On one particular occasion all the mules were out on a fairly easy ride and "IF” threw her right front shoe. As it happened, one of the other riders that day was familiar with work that a group of Farriers had done using The Perfect Horse®. After examining the thin walled, shelly cracked hooves, the rider understood that this mule couldn’t possibly keep shoes on with hooves like this and something needed to be done. He suggested the Veerkamps' start a regiment of feeding 1 ½ ozs of The Perfect Horse®twice a day. They were willing to try the product, and feeding began almost immediately. Over the first five days the product was introduced slowly finally reaching that recommended feeding rate of 1 ½ ozs of The Perfect Horse® twice a day. This worked very well because "IF” was at the bottom of the pecking order and now she was being separated out from the rest of the mules, to feed the The Perfect Horse®, and she could eat in peace. "IF” would become due for a trim seven weeks later, and an evaluation of her progress would be made at the time. Gregg Anderson arrived at the Veerkamp’s and prepared to trim the mules for the winter. The Veerkamp’s had not told him of the change in diet. 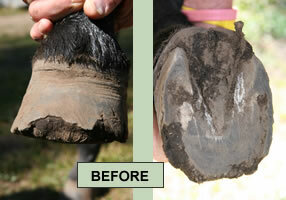 When he began to pare the sole of the hoof, this is what he found. Which led Gregg to say "IF’s” hooves are much stronger and better than I’ve ever seen them.” The Veerkamp’s told Greg about the The Perfect Horse®, to which he replied,” we’ll see how they look the next time I’m out in the February”. Here is what he found in February… To his amazement, when he went to look for "IF” amongst the herd, he had trouble finding her… His comment, "I almost didn’t recognize her she looks so healthy”. As dramatic as these improvements are, the prognoses is even greater for "IF’s” total health because of the regular use of The Perfect Horse®, professional Farrier care, and caring owners like Doug and Lori Veerkamp. This is without a doubt one of the most exciting trials forThe Perfect Horse®, the results have been and continue to be extremely dramatic, and only because "IF’s” had so many problems and the The Perfect Horse® provided the solution in a dramatic fashion.